Five thousand years ago, Gokul was the home to Krishna’s magical childhood where he performed innumerable loving pastimes. When Indra threatened the Vrajavasis with torrential rains, blasts of thunder and lightening, and the consequent over flooding of Yamuna – all to inundate the village, And if you were present there how would you experience all this????? And the relief the village residents felt when Krishna lifted the Govardhan Hill and protected them! The proposed Krishna Lila Park will give such an experience to the visitors. The main complex building will be about 360 feet tall, with a viewing gallery at 500 ft level. This hi-tech amusement park to be constructed in Bangalore on 28 acre will be the 1st theme park in India with the quality of world class theme parks like Disney World and Universal Studios. Already Rs 4-5 crore has been spent on the design. The project will cost Rs 350 crore. Work on theme park to take off on, Sunday Jun 20th, 2010. Today, our children’s minds are obsessed with Superman, Spiderman and such other characters and legends coming from the West. The purpose of Krishna Lila Park is to present, preserve and promote the cultural heritage of India as described in the ancient Indian classics, to the contemporary society, in an interesting and captivating presentation. We want to impress upon the younger generation the glorious pastimes of our vedic heroes like Krishna, Rama and Hanuman. Today, our children’s minds are obsessed with Superman, Spiderman and such other characters and legends coming from the West. We want to introduce the great characters of our Indian epics and instill in the minds of our children the deep values they represent. This is an unprecedented and historical project being attempted for the first time in our country. The narrative strategy used known as technology assisted multi-sensory immersive and experiential story telling. This is the kind of communication strategy that the worlds best Theme Parks like Disney World, EPCOT and Universal Studios use. 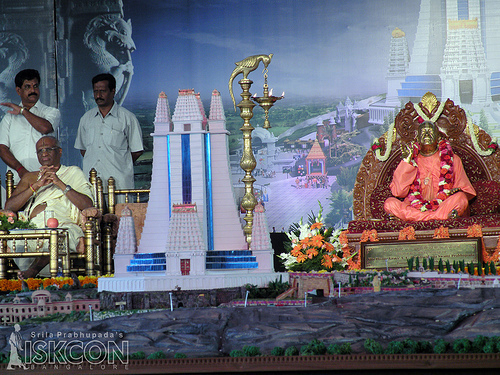 Iskcon launches spiritual theme park at vaikunta Hill Bangalore -The main temple complex building will be about 360 feet tall, with a viewing gallery at 500 ft level. The Krishna Heritage Tower will house the Sri Puri Jagannath Mandir and the Sri Radha Krishna Mandir. 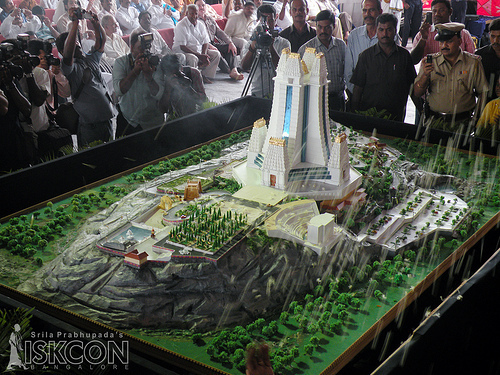 At the 500 ft level, the complex will have the Sri Venkateshwara Sky Temple.